Objectives Remote ischaemic conditioning (RIC) confers cardioprotection in patients with ST segment elevation myocardial infarction (STEMI) undergoing primary percutaneous coronary intervention (pPCI). We investigated whether preinfarction angina and coronary collateral blood flow (CCBF) to the infarct-related artery modify the efficacy of RIC. Design Post hoc subgroup analysis of a randomised controlled trial. Participants A total of 139 patients with STEMI randomised to treatment with pPCI or RIC+pPCI. Interventions RIC was performed prior to pPCI as four cycles of 5 min upper arm ischaemia and reperfusion with a blood pressure cuff. Primary outcome measure Myocardial salvage index (MSI) assessed by single-photon emission computerised tomography. We evaluated the efficacy of RIC in subgroups of patients with or without preinfarction angina or CCBF. Results Of 139 patients included in the study, 109 had available data for preinfarction angina status and 54 had preinfarction angina. Among 83 patients with Thrombolysis In Myocardial Infarction flow 0/1 on arrival, 43 had CCBF. Overall, RIC+pPCI increased median MSI compared with pPCI alone (0.75 vs 0.56, p=0.045). 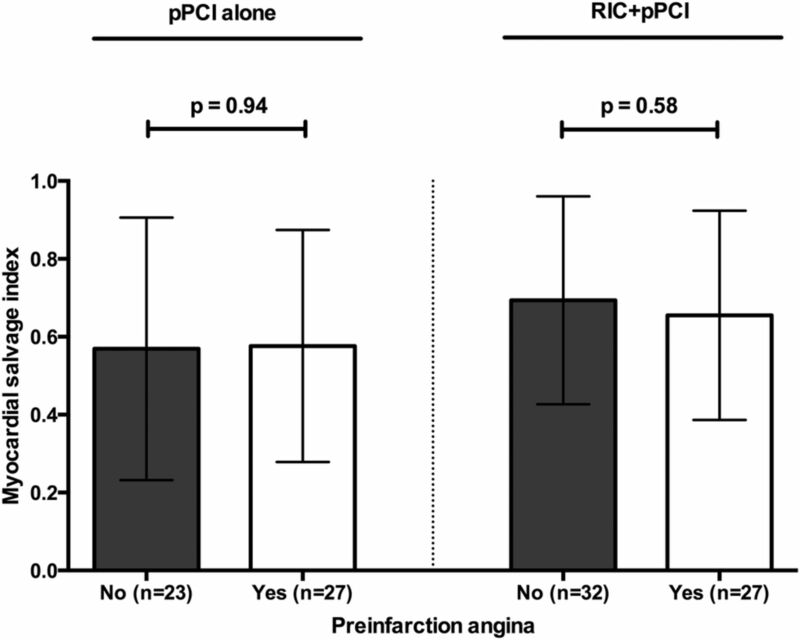 Mean MSI did not differ between patients with and without preinfarction angina in either the pPCI alone (0.58 and 0.57; 95% CI −0.17 to 0.19, p=0.94) or the RIC+pPCI group (0.66 and 0.69; 95% CI −0.18 to 0.10, p=0.58). Mean MSI did not differ between patients with and without CCBF in the pPCI alone group (0.51 and 0.55; 95% CI −0.20 to 0.13, p=0.64), but was increased in patients with CCBF versus without CCBF in the RIC+pPCI group (0.75 vs 0.58; 95% CI 0.03 to 0.31, p=0.02; effect modification from CCBF on the effect of RIC on MSI, p=0.06). Conclusions Preinfarction angina did not modify the efficacy of RIC in patients with STEMI undergoing pPCI. CCBF to the infarct-related artery seems to be of importance for the cardioprotective efficacy of RIC. Trial registration number NCT00435266, Post-results. Potential inherent cardioprotective effect from preinfarction angina and coronary collateral blood flow (CCBF) to the infarct-related artery may modify the efficacy of adjunctive treatment strategies in patients with ST segment elevation myocardial infarction (STEMI). This is the first evaluation of the influence of preinfarction angina and CCBF to the infarct-related artery on the efficacy of remote ischaemic conditioning (RIC) prior to primary percutaneous coronary intervention (PCI) in patients with STEMI. We found that preinfarction angina does not seem to modify the efficacy of RIC, but CCBF to the infarct-related artery seems of importance for the cardioprotective efficacy of RIC. Our findings implicate that RIC could be initiated in all patients with STEMI referred for primary PCI even with a history of preinfarction angina and at the time when the CCBF status is unknown. Because of limited statistical power, this post hoc analysis should be considered explorative. Reperfusion injury following restoration of coronary blood flow by primary percutaneous coronary intervention (pPCI) or thrombolysis adds significantly to the ischaemic damage of the myocardium in patients with acute myocardial infarction.1 Remote ischaemic conditioning (RIC) is a mechanical cardioprotective strategy conferred by short-term intermittent periods of ischaemia and reperfusion of the upper extremity induced by inflations and deflations of a blood pressure cuff.2 RIC has emerged as a promising strategy against ischaemia–reperfusion injury in patients with ST segment elevation myocardial infarction (STEMI)2 and may translate into improved long-term clinical outcome.3 However, in patients with STEMI, potential inherent cardioprotective effects from preinfarction angina4 ,5 and coronary collateral blood flow (CCBF) to the infarct-related artery6–8 may attenuate the beneficial effect from RIC. We aimed to investigate whether preinfarction angina and CCBF modify the cardioprotective efficacy of RIC in patients with STEMI undergoing pPCI. We performed a post hoc analysis of a single-centre, randomised controlled trial at the Department of Cardiology, Aarhus University Hospital, Denmark.9 The study protocol and patient randomisation have previously been described in detail.9 In brief, a total of 333 patients were enrolled between February 2007 and November 2008. Inclusion criteria were (1) age ≥18 years, (2) duration of symptoms ≤12 hours prior to admission and (3) ST segment elevation ≥0.1 mV in two or more contiguous electrocardiogram leads. Exclusion criteria from data analysis were (1) diagnosis not confirmed on arrival to the hospital, (2) history of previous myocardial infarction, (3) history of previous coronary artery bypass surgery and (4) chest pain >12 hours prior to admission. Patients with a tentative diagnosis of STEMI were randomised to standard treatment with pPCI or treatment with RIC preceding pPCI. RIC was initiated in the ambulance during transportation to the hospital and performed as four cycles of 5 min upper arm ischaemia followed by 5 min of reperfusion using a standard blood pressure cuff inflated to 200 mm Hg. The study end point was myocardial salvage index (MSI) on day 30 following pPCI and was obtained from single-photon emission computerised tomography (SPECT) imaging on arrival and on day 30. Patients received 99Technetium sestamibi intravenously prior to pPCI followed by SPECT imaging within 8 hours of injection to quantify myocardial area-at-risk of infarction. On day 30 following pPCI, a similar SPECT imaging protocol was performed 1 hour after tracer injection to quantify final infarct size. Myocardial area-at-risk of infarction and final infarct size were determined as the percentage of the left ventricle. MSI expresses the proportion of the myocardium at risk of infarction being salvaged by the assigned treatment, and was calculated as: (area-at-risk÷final infarct size)/area-at-risk. Experienced nuclear cardiology readers who were blinded to treatment assignment and clinical data analysed SPECT imaging data. All randomised patients from the parent trial fulfilling the inclusion criteria and with available data for MSI were included in the present study. All patients regardless of Thrombolysis In Myocardial Infarction (TIMI) flow on arrival constituted the preinfarction angina study cohort. Preinfarction angina was defined as ≥1 episodes of angina within 48 hours prior to the STEMI. Information concerning preinfarction angina was collected retrospectively from patient medical records. Patients for which no such information was available were excluded from data analysis. 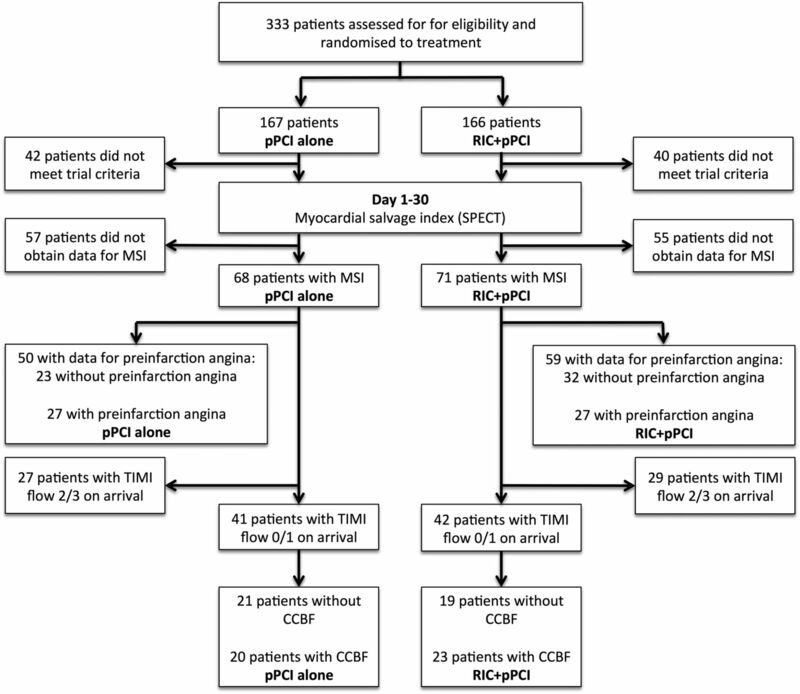 Only patients with TIMI flow 0/1 on arrival constituted the coronary collateral study cohort. Preprocedural CCBF to the infarct-related artery was assessed on the pre-pPCI coronary angiogram and classified in accordance with the Rentrop grading system10 by two dedicated observers blinded to treatment allocation and clinical data. Both observers assessed the coronary angiogram and a consensus was reached. The Rentrop grading system provides a score for the spontaneously visible or recruitable coronary collateral circulation following occlusion of the coronary vessel.11 Collateral filling of the infarct-related artery was visibly assessed and assigned a score as follows: 0=no filling, 1=filling of the side branches, 2=partial filling of the epicardial segment and 3=complete filling of the epicardial segment. Patients were grouped as either having CCBF (Rentrop score 1–3) or no CCBF (Rentrop score 0). Healthcare system delay was obtained from emergency medical service-related and pPCI-related registries and files, and defined as time from emergency medical service call to the pPCI wire traversing the culprit lesion. Electrocardiogram recordings provided data for achieved 70% or more ST segment resolution within 90 min after first pPCI wire. The parent trial was conducted in accordance with the Declaration of Helsinki (2000) of the World Medical Association, approved by the local ethics committee and registered with clinicaltrials.gov (NCT00435266). Written informed consent was obtained from all participants prior to inclusion. STATA/SE V.13 (StataCorp, College Station, Texas, USA) and GraphPad PRISM V.6 (GraphPad Software, La Jolla, California, USA) were used for statistical analysis. Data were tested for normal distribution and equality of variance prior to analysis. Continuous variables were compared by Student's t-test or Mann-Whitney U test for parametric and non-parametric data. Categorical variables were compared with the χ2 test or Fisher's exact test. Simple linear regression analysis was used for crude effect modification analysis, that is, test for interaction. We performed additional multiple linear regression analyses with adjustment for potential confounding variables that could influence on MSI, that is, preprocedural vessel patency (TIMI flow 0/1 vs 2/3),7 healthcare system delay (minutes),12 treatment allocation (pPCI alone vs RIC+pPCI)9 and any baseline variable with a p value of <0.05 in between the studied groups. We justified the use of linear regression models by checking variance of error, the distribution of variance and a normal distribution of residuals prior to their application. We used Spearman's rank correlation analysis to determine the correlation between the degree of CCBF, that is, the Rentrop score, and MSI in patients treated with pPCI alone or RIC+pPCI. Data are expressed as number (%), mean (SD) with 95% CI for the difference in mean or median (IQR). For multiple linear regression analyses, data are expressed as regression coefficient with 95% CI for the regression coefficient. For Spearman's rank correlation analysis, data are expressed as the Spearman correlation coefficient, ρ. Statistical significance was set as two-sided p value of <0.05. Of 333 patients enrolled in the parent trial, 251 patients were eligible for trial imaging follow-up. Of these, 111 patients did not achieve both SPECT scans necessary for MSI calculation. One patient was excluded from data analysis due to re-infarction between first and second SPECT scan resulting in unreliable MSI data. Consequently, data for MSI were available for a total of 139 patients (pPCI alone n=68 and RIC+pPCI n=71; figure 1). Of these, 129 patients had available data for healthcare system delay (pPCI alone n=66 and RIC+pPCI n=63) and 131 patients had available data for achieved 70% ST segment resolution (pPCI alone n=64 and RIC+pPCI n=67). Baseline and procedural variables, including achieved post-pPCI TIMI flow and 70% ST segment resolution, were similar in the treatment groups except for hypertension, which was more common among patients treated with RIC+pPCI (table 1). Study flow chart for patients included in the preinfarct angina and coronary collateral study cohorts. See text for details. CCBF, coronary collateral blood flow; MSI, myocardial salvage index; pPCI, primary percutaneous coronary intervention; RIC, remote ischaemic conditioning; SPECT, single-photon emission computerised tomography; TIMI, Thrombolysis In Myocardial Infarction. Overall, RIC+pPCI increased median MSI compared with pPCI alone (0.75 (IQR: 0.50–0.93) vs 0.56 (IQR: 0.35–0.89), p=0.045), including in a multiple linear regression analysis with adjustment for healthcare system delay, preprocedural vessel patency and hypertension (0.11 increase in MSI from RIC+pPCI; 95% CI 0.004 to 0.21, p=0.04). A total of 109 patients had available information concerning preinfarct angina; of which, 54 (50%) patients had preinfarction angina within 48 hours preceding the STEMI, whereas 55 (50%) did not (figure 1). Baseline characteristics, procedural data, including achieved post-pPCI TIMI flow and 70% ST segment resolution, and treatment allocation did not differ between patients with and without preinfarction angina (table 2). Overall, preinfarction angina did not affect mean MSI compared with no preinfarction angina (0.62 (SD: 0.28) and 0.64 (SD: 0.30); 95% CI −0.14 to 0.09, p=0.65), including in a multiple linear regression analysis with adjustment for treatment allocation, healthcare system delay and preprocedural vessel patency (−0.02 decrease in MSI from preinfarction angina; 95% CI −0.13 to 0.09, p=0.73). In the preinfarction angina study cohort, RIC+pPCI overall increased mean MSI borderline statistically significant compared with pPCI alone (0.68 (SD: 0.27) and 0.57 (SD: 0.31); 95% CI −0.007 to 0.21, p=0.07), including in a multiple linear regression analysis with adjustment for healthcare system delay, preprocedural vessel patency, hypertension and preinfarction angina (0.11 increase in MSI from RIC+pPCI; 95% CI −0.003 to 0.23, p=0.056). We found no difference in mean MSI between patients with and without preinfarction angina among those treated with pPCI alone (0.58 (SD: 0.30) and 0.57 (SD: 0.34); 95% CI −0.17 to 0.19, p=0.94) or those treated with RIC+pPCI (0.66 (SD: 0.27) and 0.69 (SD: 0.27); 95% CI −0.18 to 0.10, p=0.58; figure 2). Accordingly, we found no effect modification from preinfarction angina on the effect of RIC on MSI by crude interaction analysis (p=0.69). In a multiple linear regression analysis with adjustment for healthcare system delay and preprocedural vessel patency, MSI did not differ between patients with and without preinfarction angina among those treated with pPCI alone (−0.01 decrease in MSI from preinfarction angina; 95% CI −0.18 to 0.17, p=0.92) or those treated with RIC+pPCI (−0.07 decrease in MSI from preinfarction angina; 95% CI −0.22 to 0.08, p=0.32) with no effect modification from preinfarction angina on the effect of RIC on MSI by interaction analysis (p=0.59). Bar graphs (mean) with whiskers (SD) of myocardial salvage index in categories of patients without preinfarction angina and with preinfarction angina in respect to treatment allocation. See text for details. p Values are based on Student's t-test. pPCI, primary percutaneous coronary intervention; RIC, remote ischaemic conditioning. Eighty-three patients had TIMI flow 0/1 on arrival; 43 (52%) patients had angiographically visible CCBF, whereas 40 (48%) patients did not (figure 1). Except for current smokers, who were more frequent among patients with CCBF, baseline characteristics did not differ between patients with and without CCBF (table 3). Procedural variables, including myocardial area-at-risk of infarction and achieved post-pPCI TIMI flow and 70% ST segment resolution, were similar between patients with and without CCBF except for culprit lesion located in the left anterior descending artery, which was more common in patients without CCBF (table 3). The prevalence of CCBF did not differ between patients treated with pPCI alone or RIC+pPCI (20/41 (49%) and 23/42 (55%), p=0.59). Overall, the presence of CCBF did not affect mean MSI compared with the absence of CCBF (0.64 (SD: 0.25) and 0.57 (SD: 0.26); 95% CI −0.04 to 0.19, p=0.20), including in a multiple linear regression analysis with adjustment for treatment allocation, healthcare system delay, left anterior descending artery infarction and current smoking (0.05 increase in MSI from CCBF; 95% CI −0.08 to 0.17, p=0.45). In the coronary collateral study cohort, RIC+pPCI overall increased mean MSI compared with pPCI alone (0.67 (SD: 0.24) vs 0.53 (SD: 0.26); 95% CI 0.03 to 0.25, p=0.01), including in a multiple linear regression analysis with adjustment for healthcare system delay, hypertension and CCBF (0.14 increase in MSI from RIC+pPCI; 95% CI 0.03 to 0.25, p=0.01). We found no difference in mean MSI between patients with or without CCBF among those treated with pPCI alone (0.51 (SD: 0.26) and 0.55 (SD: 0.26); 95% CI −0.20 to 0.13, p=0.64). In contrast, mean MSI was increased in patients with CCBF compared with patients without CCBF among those treated with RIC+pPCI (0.75 (SD: 0.19) vs 0.58 (SD: 0.27); 95% CI 0.03 to 0.31, p=0.02; figure 3). Accordingly, we found a statistically borderline significant effect modification from CCBF on the effect of RIC on MSI by crude interaction analysis (p=0.06), with the presence of CCBF favouring the effect of RIC+pPCI treatment. In a multiple linear regression analysis with adjustment for healthcare system delay, left anterior descending artery infarction and current smoking, MSI did not differ between patients with and without CCBF among those treated with pPCI alone (−0.08 decrease in MSI from CCBF; 95% CI −0.28 to 0.13, p=0.45). In patients with CCBF, MSI was borderline significantly increased compared with patients without CCBF among those treated with RIC+pPCI (0.14 increase in MSI from CCBF; 95% CI −0.01 to 0.30, p=0.07). However, the effect modification from CCBF on the effect of RIC on MSI was not statistically significant by interaction analysis (p=0.14). Bar graphs (mean) with whiskers (SD) of myocardial salvage index in categories of patients without coronary collateral blood flow and with coronary collateral blood flow in respect to treatment allocation. See text for details. p Values are based on Student's t-test. pPCI, primary percutaneous coronary intervention; RIC, remote ischaemic conditioning. We noticed a statistically borderline significant correlation between the Rentrop score and an increase in MSI among patients treated with RIC+pPCI (ρ=0.29, p=0.06) but not among patients treated with pPCI alone (ρ=0.007, p=0.97; figure 4). When evaluating patients with limited CCBF only (Rentrop score 1), treatment with RIC+pPCI significantly increased mean MSI compared with pPCI alone (0.76 (SD: 0.21) vs 0.39 (SD: 0.22); 95% CI 0.15 to 0.61, p=0.003). Bar graphs (mean) with whiskers (SD) of the correlation between the Rentrop coronary collateral blood flow score and myocardial salvage index with respect to treatment allocation. See text for details. p Values are based on Spearman's rank correlation analysis. pPCI, primary percutaneous coronary intervention; RIC, remote ischaemic conditioning. The main finding of the present study is that preinfarction angina does not seem to modify the efficacy of RIC in patients with STEMI undergoing pPCI. In contrast, our exploratory post hoc analysis indicates that CCBF to the infarct-related artery seems to influence the cardioprotective efficacy of RIC. Preinfarction angina per se may be cardioprotective and improve survival in patients with acute myocardial infarction.13 ,14 The development of coronary collaterals15 and activation of an inherent ischaemic preconditioning-like effect16 are potential underlying mechanisms. Mechanisms may vary depending on the timing of preinfarction angina. While the development of functional collateral vessels presumably requires time,17 a preconditioning effect could be almost immediate.2 Consistent with this assumption, patients with unstable angina or preinfarction angina closely preceding the acute myocardial infarction seem to have a more pronounced benefit of preinfarction angina in terms of mortality reduction.18 In patients with STEMI treated with pPCI, preinfarction angina has been found to increase myocardial salvage,4 whereas the effects on infarct size4 ,5 ,19 ,20 and mortality are ambiguous.20 ,21 In contrast to Lønborg et al,4 we found no overall effect of preinfarction angina on myocardial salvage. Our cohort size and suboptimal retrospective evaluation of preinfarction angina occurrence did not allow stratification of the number and severity of preinfarction angina episodes. Thus, differences in confounding factors or patient comorbidities may explain the discrepant findings.22 Importantly, preinfarction angina prior to the STEMI did not compromise the efficacy of RIC. The presence of coronary collateral circulation favours clinical outcome in patients with acute and chronic coronary artery disease.23 In contrast, evidence of a direct cardioprotective effect of CCBF in patients with STEMI has shown conflicting effects on myocardial salvage4 ,7 and infarct size.4 ,6–8 Collateral evolvement occurs as a result of coronary artery obstruction,17 but whether short episodes of myocardial ischaemia itself result in immediate CCBF recruitment remains controversial.24–26 While myocardial tolerance to ischaemia from repetitive ischaemic stimuli may correlate with CCBF recruitment,25 myocardial tolerance to ischaemia from exercise-induced angina does not.26 Intuitively, well-established CCBF might inherently translate into infarct size reduction and improved clinical outcome by smaller area-at-risk of infarction. Consistent with previous findings,4 ,7 ,8 we found that area-at-risk did not differ between patients with and without CCBF to the infarct-related artery, and that CCBF did not affect MSI in patients with STEMI undergoing pPCI. Differences in imaging modalities, such as MRI4 or a combined angiographic–MRI protocol,7 may influence quantitative assessment of area-at-risk and MSI and challenge comparison. We used SPECT to delineate area-at-risk and final infarct size to avoid potential bias from tissue oedema, which may vary within the postinfarction period27 leaving MSI estimates by cardiac MRI potential inaccurate.28 Although limited spatial resolution of SPECT imaging may compromise detection of small differences in area-at-risk of infarction, SPECT remains the most validated method for assessment of area-at-risk of infarction. Our findings indicate that CCBF has limited protective effect on myocardial salvage in patients with STEMI. 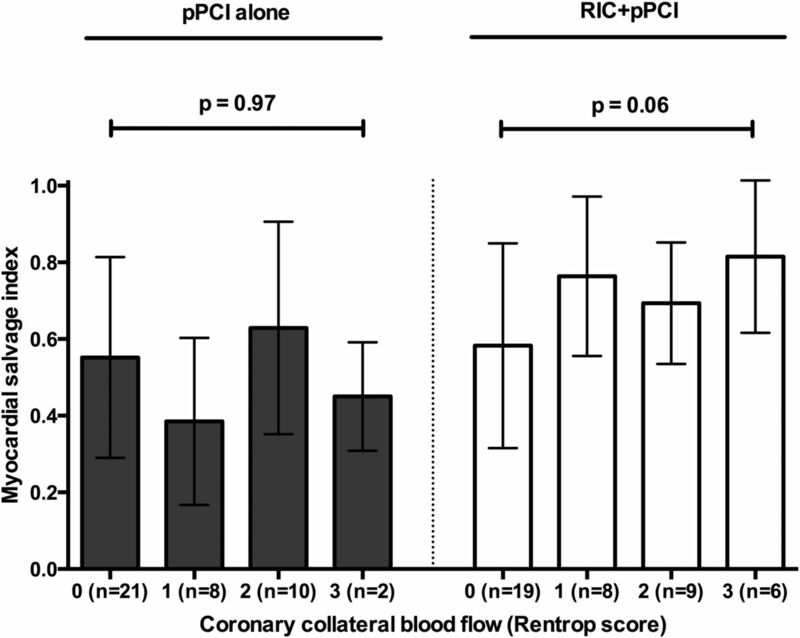 While RIC reduced coronary microvascular resistance and increased coronary blood flow in an experimental porcine model,29 RIC neither modified coronary microvascular resistance nor baseline and adenosine-induced hyperaemic coronary blood flow velocity in patients undergoing elective percutaneous coronary intervention.30 It remains uncertain to which extent RIC influences myocardial perfusion and CCBF recruitment. 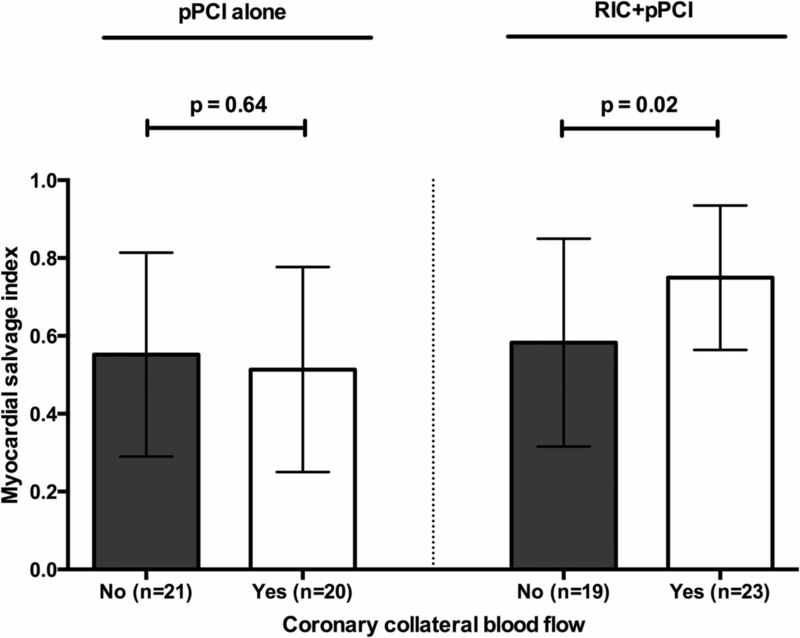 In our study, the presence of visible coronary collaterals did not differ between patients either treated with pPCI alone or RIC+pPCI, suggesting that RIC does not confer cardioprotection by recruitment of the coronary collateral circulation. Importantly, RIC predominantly induced cardioprotection among patients with CCBF. However, cardioprotection from RIC has been demonstrated in a large number of animal models,2 with varying degree of coronary collateral circulation.31 While CCBF may not be critical for achieving cardioprotection by RIC, our findings suggest that the coronary collateral circulation plays a potential role for mediating the effect of RIC in humans. Limited CCBF seems sufficient to confer cardioprotection from RIC, but the efficacy of RIC may be amplified by the degree of CCBF. Cardioprotection from RIC is at least partly mediated through circulating humoral factors generated during the RIC stimulus.2 Our findings are consistent with a CCBF-dependent facilitated delivery of circulating cardioprotective factors to the myocardium threatened by ischaemia–reperfusion injury. In addition, the coronary collateral circulation has substantial modifiable vasomotor capacity, which may be involved in protective effects from RIC. Although the absence of CCBF may modify the cardioprotective effect of RIC, no patient group has demonstrated adverse effects from RIC treatment.32 Thus, RIC treatment could be initiated in all patients with STEMI referred for pPCI even when the CCBF status is unknown. The uneven distribution of left anterior descending artery infarctions and current smokers between patients with and without CCBF may introduce potential confounding. However, in the parent trial, the cardioprotective effect of RIC was most pronounced in patients with left anterior descending artery infarction,9 and in a recent substudy investigating the same patient population as the present study, smoking attenuated the effect of RIC.32 Consequently, the uneven distribution of left anterior descending artery infarctions and current smokers could only have dragged our findings towards zero. Assessment of preinfarction angina depends on symptom recognition and holds risk of re-call bias and misinterpretation of non-cardiac symptoms. Preinfarction ischaemia may be silent. We cannot conclude on ischaemic episodes not recognised by the patients. The Rentrop grading system is semiquantitative but a widely used method for CCBF classification allowing retrospective assessment of CCBF without postponing reperfusion therapy. Our study design did not allow evaluation of any causal relationship between the influence of preinfarction angina and CCBF on the efficacy of RIC. Our findings indicate a need for concomitant assessment of the coronary collateral circulation when exploring the mechanisms behind RIC. Preinfarction angina did not modify the efficacy of RIC in patients with STEMI undergoing pPCI. In contrast, preprocedural CCBF to the infarct-related artery seems to be of importance for the cardioprotective efficacy of RIC. Collaborators CONDI Investigators: R Kharbanda, AK Kaltoft, CJ Terkelsen, NH Andersen, TM Hansen, S Trautner, JF Lassen, EH Christiansen, LR Krusell, SD Kristensen, L Thuesen, SS Nielsen, M Rehling, HT Sørensen, AN Redington and TT Nielsen. Contributors KP, MRS and HEB did the data analysis and drafting of the manuscript. All authors participated in data acquisition and critical revision of the manuscript. Funding This work was supported by Fondation Leducq (06CVD), the Danish Council for Independent Research (11-108354) and the Danish Council for Strategic Research (11-115818). Competing interests MRS and HEB are shareholders in CellAegis Devices. Ethics approval The Danish Committee on Health Research Ethics and The Danish Data Protection Agency. Data sharing statement Raw data and statistical coding are available from the corresponding author at kpryds@clin.au.dk.